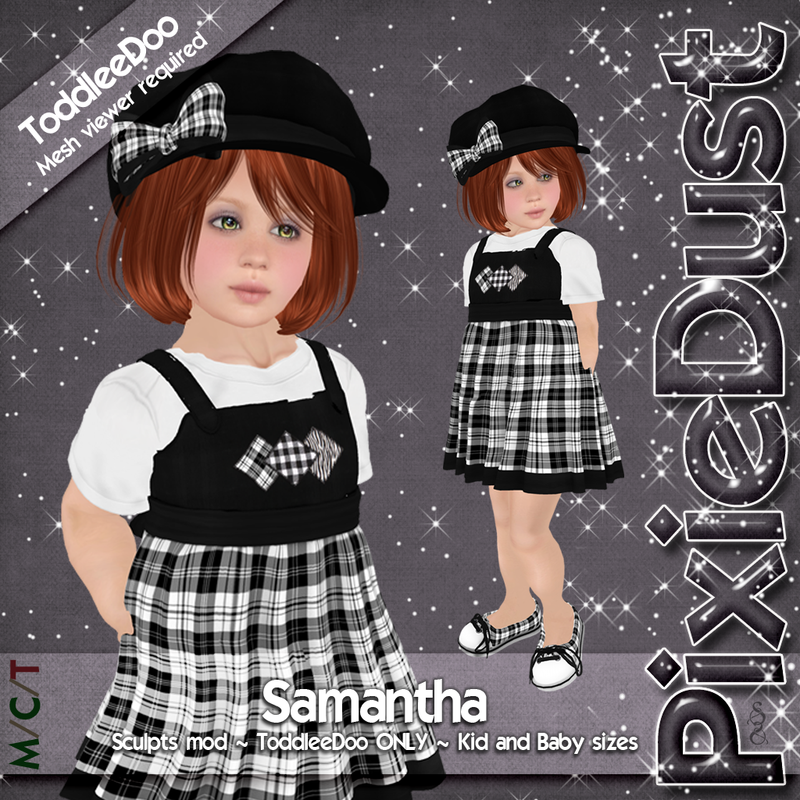 A very special 50L Father's Day Friday brings everyone's favorite... GATCHAS... back to Pixie*Dust! 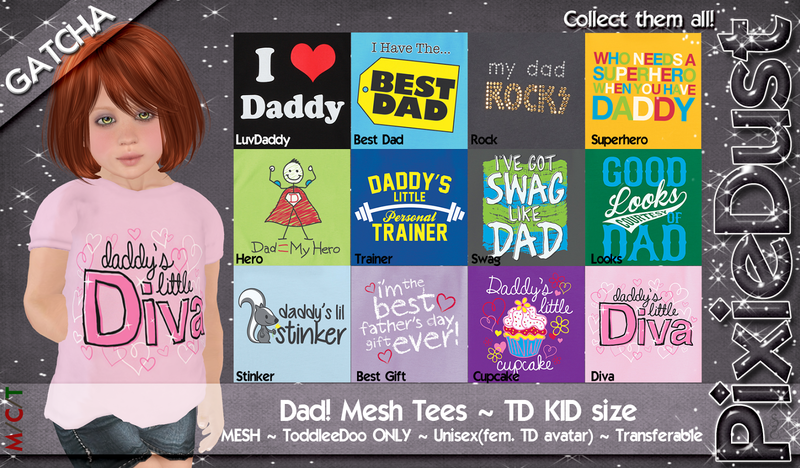 Hurry over during our special 50L weekend to play our brand-new gatcha for Father's Day tees, only 25L a play through Father's Day. 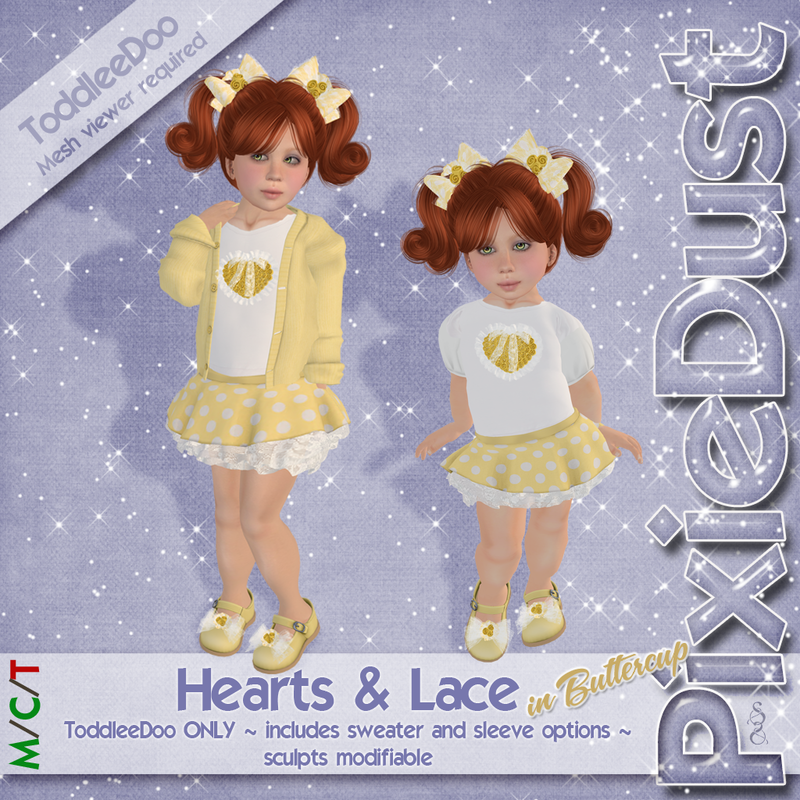 Three gatchas hold tees for ToddleeDoo babies, ToddleeDoo kids, and yes, regular child avatars too. Play for any of twelve different shirts: shirts are transfer only, so bring a friend and swap all your extras. Good luck to everyone trying to register for camp, and stay tuned! 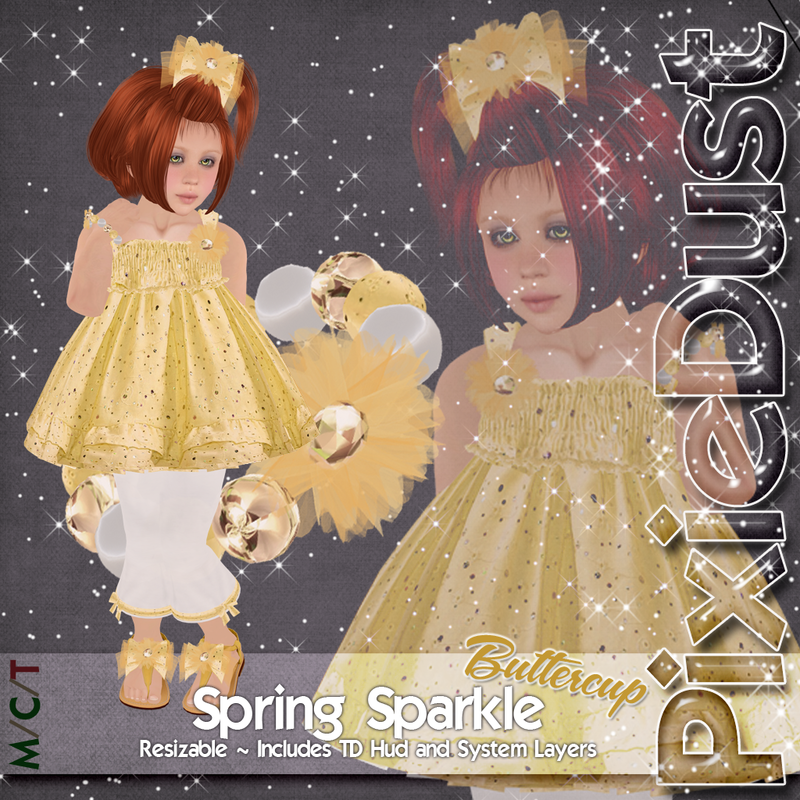 Pixie*Dust will be bringing you all sorts of new camp and cabin goodies. And of course, CABIN CAPS™ are on their way! Welcome in the summer with this adorable playset from Pixie*Dust! Zephyr is perfect for picnics, playing on the beach, heading for camp, and all your other favorite photo opportunities. A white mesh romper with navy polkadots is accented with striped ties and bright red flowers. Closed-toe sandals with big bows, and your choice of a sun hat or hair bow complete your look. Zephyr includes pieces for both ToddleeDoo kids and babies, and all nonrigged parts are modifiable and/or include a multi-axis resizer script, guaranteeing as always that you can achieve a perfect fit. Keep Pixie*Dust in mind for all your summer fun shopping and keep the magic! Announcing the first release in our long-awaited boys' line! WanderLust is finally here with our first offering, "Motocross" ONLY at the Live. Laugh. Love Fair! Motocross is a 50% donation item. 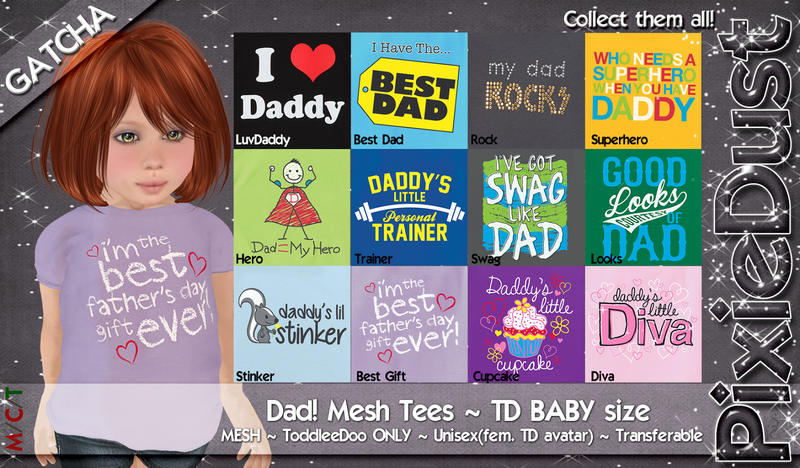 Motocross is mesh and sculpts, fitting ToddleeDoo kids and babies. Sculpts are modifiable. Includes tee shirt and shorts, slip ons and appliqued baseball cap. It's that time again, and Pixie*Dust™ is proud to support the annual Live. Laugh. Love fair. This year, we will be raising money for a very special charity, A Kid Again, providing support and adventures for children with life-threatening illnesses and their families. We are particularly excited about this year's charity as it is headquartered in Ohio and serves many of the children and families in our home area. 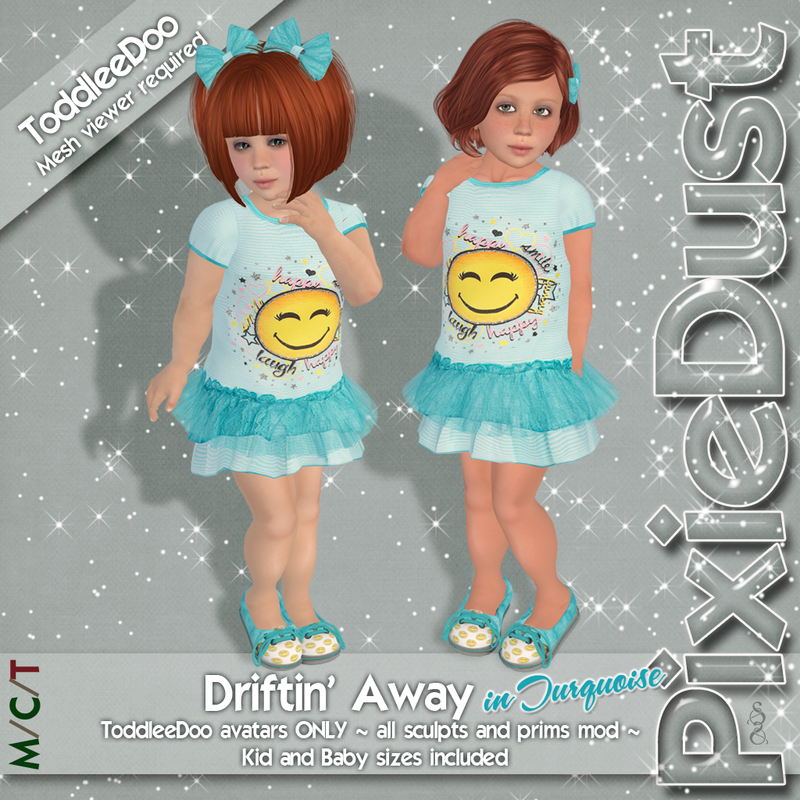 A bright and fun summer play dress, Driftin' Away comes in two colors, each with their own unique graphic design splashed across the front. Driftin' Away is mesh for ToddleeDoo kids and babies, and includes a flexi tutu accent, sneaker flats and hairbows. All sculpts are modifiable and some resizing may be necessary. 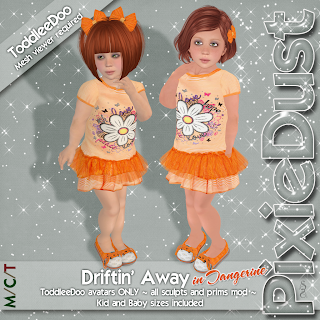 Driftin' Away in Tangerine is a 100% donation item. Hearts & Lace is a beautiful, sweet addition to any spring or summer wardrobe. A fluffy dotted skirt tiered with tons of lace complements a simple shirt with a full-prim accent heart of roses and lace. The shirt can be worn alone with its sculpted sleeves, or for chillier days, you can choose the matching mesh cardigan. Leather Mary Janes and lacey hairbows complete the look. Currently available in five colors, Hearts & Lace is partial mesh and fits ToddleeDoo kids and babies. Sculpts are modifiable and some resizing may be necessary. Hearts & Lace in Pink is a 25% donation item. COMING SOON! 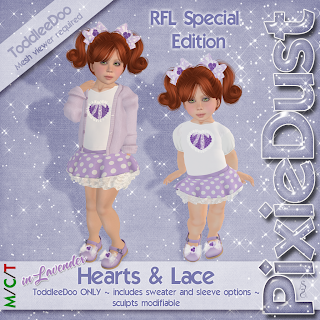 A special edition of Hearts & Lace in Lavender to benefit the Relay for Life 2013. Check the mainstore for details. Enjoy the fair, shop generously for our kids, and keep the magic! "Be. YOU. 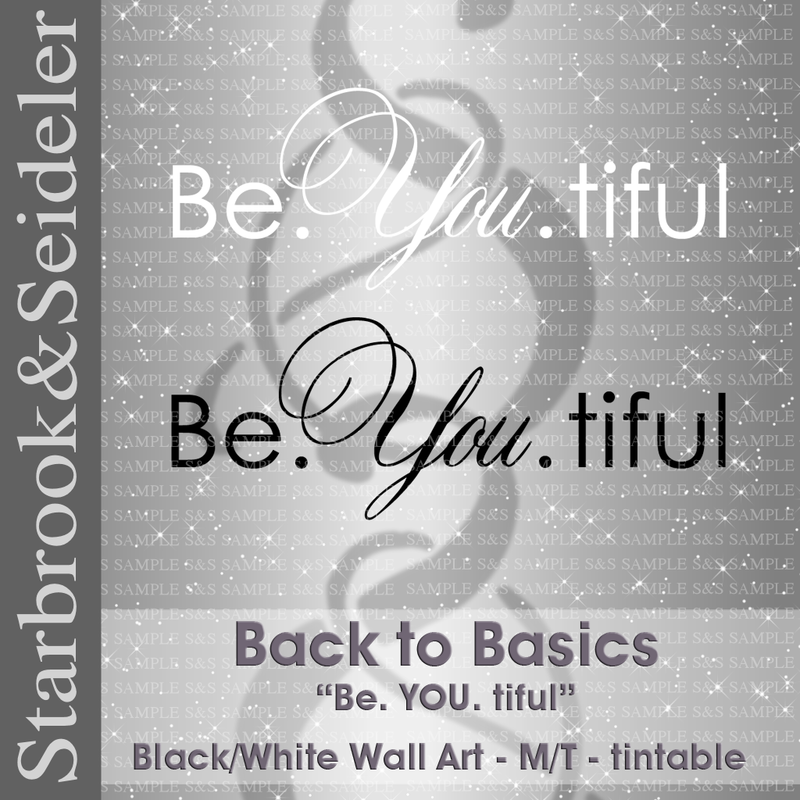 tiful" is a great wall art in our new series "Back to Basics," a simple and elegant line of quotes and phrases perfect for any room in the house. "Be. YOU. 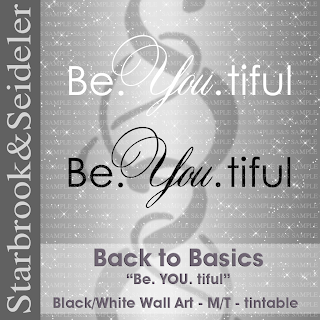 tiful" includes both a black and a white (tintable) version, and is mod and transfer, making it the perfect gift for that special someone. 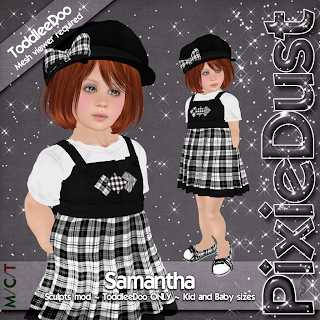 A special new outfit from ~*~[Pixie*Dust]~*~, Samantha, is only 50 Lindens through Friday, April 26th. An early 50L Friday and an adorable sparkly playset just in time for your Easter Egg hunts and for your pretty spring wardrobe. Two colors are on special now through Friday for just 50 lindens. Grab them quick! All other colors are available at our regular great prices. ~*~[Pixie*Dust]~*~ has MOVED down the road from our old location into the corner of the sim. If you don't see us when you arrive, head north a wee bit. 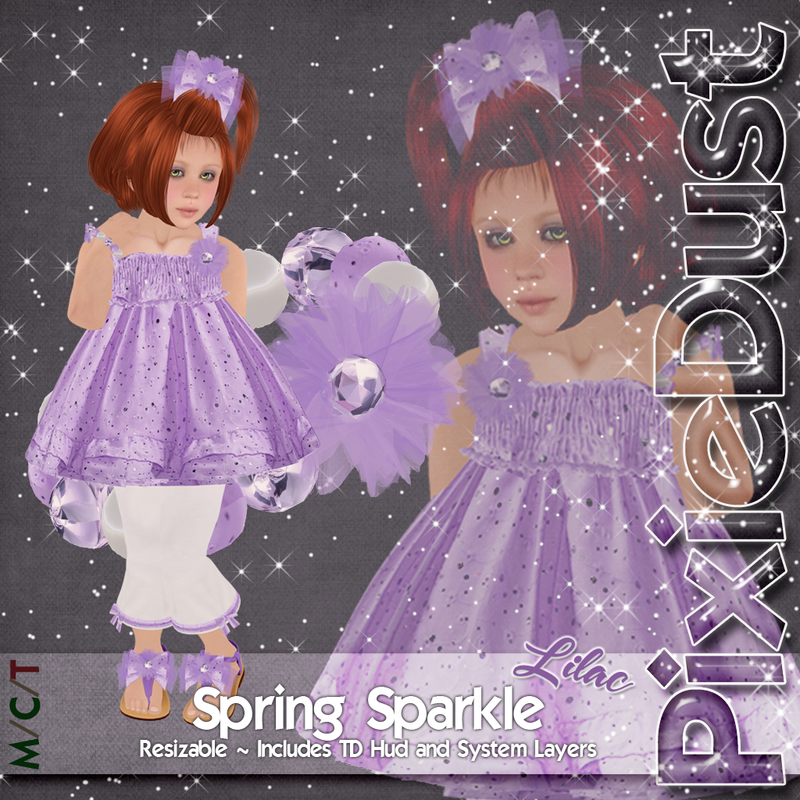 Happy spring and keep the magic! Beautiful, lovingly crafted clothes for little girls. Bring back the magic to your second life with a little bit of ~*~[Pixie*Dust]~*~™! WanderLust for Boys coming soon! Visit us inworld or on the Marketplace. 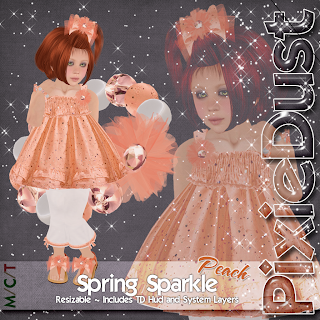 ~*~[Pixie*Dust]~*~™ is a subsidiary of Starbrook & Seideler.